From the rear side cover: In this illuminating historical account, Peter Bunnett has used as a centrepiece the wartime journal of his father, Ronald Patrick Bunnett (known as ‘Pat’ to family and friends) who, whilst serving with the 4th Indian Division during World War Two as an artillery spotter, was an eyewitness to the famous battle for Monte Cassino. Pat’s log covers a 12-day period in March 1944 during the crucial third of four hard-fought battles to remove German forces from the mountain-top monastery which occupied a commanding position above the road to Rome, 80 miles to the North, thus impeding the progress of the Allied invasion force. The nature of the terrain and the sturdiness of the monastery’s construction made it easier to defend than attack and as a result the Allied commanders were obliged to throw everything they had at it. In spite of receiving a terrible pounding from artillery and air strikes the tenacious German defenders held out far longer than seemed possible and casualties were heavy on both sides. Pat’s minute-by-minute account of the fighting, viewed from his spotter’s position, adds a sense of immediacy to the events described, as if his readers were sat alongside him, witnessing the scene for themselves as the twelve days of his journal unfold. The battle is truly bought to life and we gain an appreciation of the challenging conditions and fierce fighting experienced by the soldiers who were there. 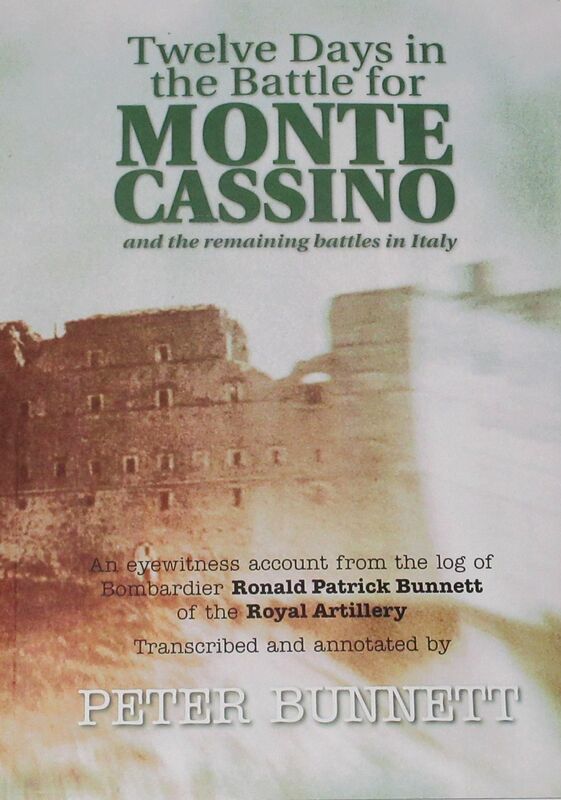 Peter Bunnett expands on the 12 days covered by his father’s journal with numerous maps and photographs and to place the events in context he provides details of Pat’s civilian life before the war, his military experiences in North Africa, Greece and Sicily prior to the Battle of Monte Cassino, and his activities afterwards, culminating in a long rail journey home to England at the end of the war.